Earth Day was first celebrated in 1970 as a day to take action towards promoting positive environmental changes in human behavior and to provoke government policy change to benefit the environment. Since then, Earth Day has been embraced by many countries around the world and is celebrated annually in countless ways by people of all ages. Members of Boston Handmade demonstrate environmental conservation and incorporate the concept of Earth Day every day as independent creative business owners producing and selling art and craft locally, and working from small studios, which reduces our own carbon footprint and that of our customers. Additionally, many Boston Handmade members keep the mindset of “reduce, reuse, recycle” as a driving force in our work through our choice of materials, and construction methods. Conserving resources is something we keep in the forefront of our minds, and harnessing the power of our own hands inspires us. 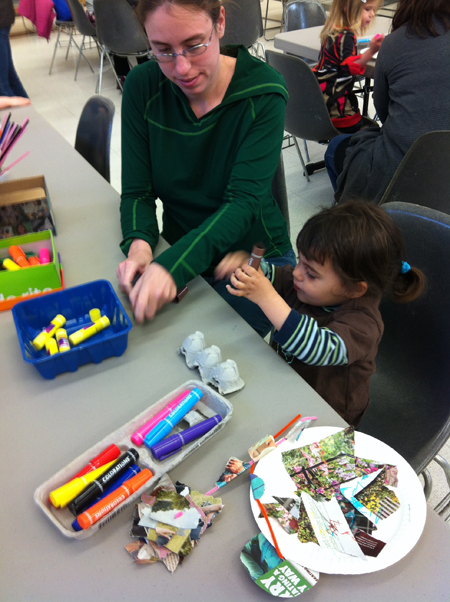 On Monday, April 22nd Boston Handmade held our first community Earth Day celebration. The event was free and open to the public and held at the Boston Public Library, Jamaica Plain branch in their large multipurpose room. 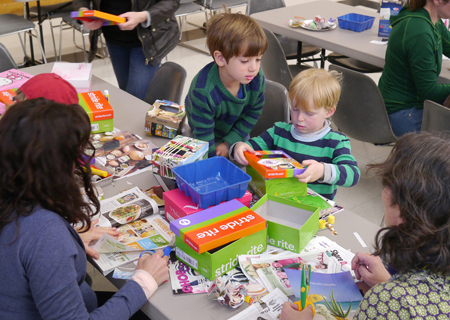 The goal of this event was to encourage creativity with household debris and to create what I like to call "garbage toys". The idea is that if we can create art and craft with materials we save from garbage and recycling bins we can keep those items out of landfills and save the energy it takes to process garbage and recycling, and whatever materials we can reuse saves us money in purchasing new supplies, and all the steps we take like this to be more environmentally conscious, creates a cascade of positive benefits for the Earth. Plus, promoting this type of creativity has educational benefits for children and the development of their problem solving abilities, and making new stuff from old stuff is just darn fun! Pretend binoculars made from toilet paper rolls. A 'Rain stick' made from a paper towel roll, an accordion folded piece of cardboard inside of it and dried lentils as the rain. Jewelry made from cardboard egg carton cups and reclaimed yarn. Photo by Kerry Hawkins. 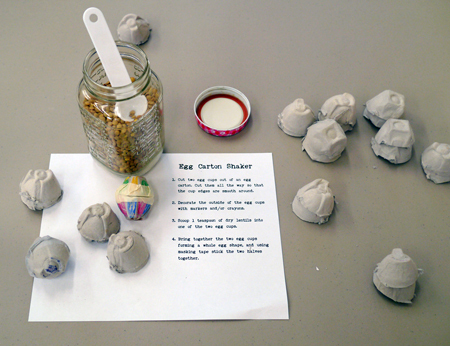 Two weeks before Earth Day I got the idea to organize this event after making cardboard egg shakers with my son's preschool class. Those 3.5-year-olds had so much fun with the project that it seemed like it could only be MORE fun to do it on a bigger scale. With not much time and a lot of supplies to gather I am very grateful to the Jamaica Plain community for all the various contributions they made and also to Harvest Co-op Markets for providing dry goods that we used to make percussion instruments, City Feed and Supply for saving their egg cartons for us to craft with, and Stride Rite for collecting shoe boxes so we could make "lap guitars". 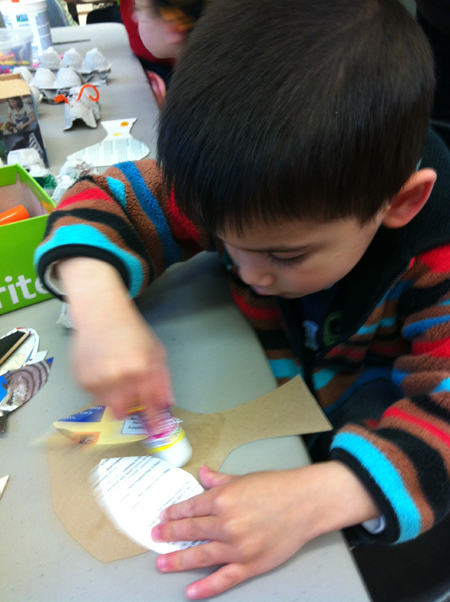 Zachary making a paper and cardboard tree for his cardboard caterpillar to eat. Photo by Jessica Burko. Among the approximately 200 people who attended the event were my son's preschool classmates and teachers who walked a few blocks from school to library for their first-ever first trip. They made caterpillars from cardboard egg cartons and a tree cut from a cereal box with leaves cut from magazine pages, so the cardboard caterpillar had something to eat. We were also delighted to have a visit from the 5th grade class at Nativity Preparatory School who made lap guitars from shoe boxes, shaker drums from large yogurt containers with dried pasta inside, and many other objects and toys of their own invention. Many parents and toddlers came by, several adults ventured in on their own, and we also had quite a few home-schoolers participating. 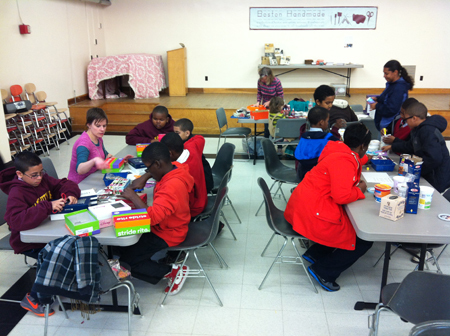 5th graders from Nativity Prep School with artist Stephanie Putland in the foreground and artist Carol Johnson at the back table. Photo by Jessica Burko. Assisting me and facilitating the many craft projects throughout the day were a few members of Boston Handmade and several local artists. The event couldn't have happened without the help and dedication of these wonderful artists and craftspeople: Amy Hitchcock, Bev Feldman, Carol Johnson, Cristina Hurley, Lauren Teller, and Stephanie Putland. 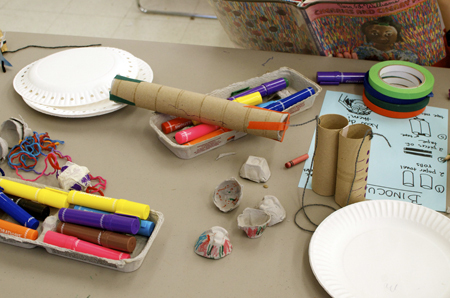 We spent the day, from 10am to 4pm making a wide array of toys, art, musical instruments, sculptures and art. Three Earth Day event participants and the wonderful trees they made from cereal box cardboard, toilet paper rolls, reclaimed yarn, and a lot of imagination. Photo by Jessica Burko. In an effort to educate while we explored our creativity, the library provided a wonderful display of books with Earth friendly themes, and I posted information about ways we can all help the environment. To encourage more environmentally conscious behavior I also asked everyone to pledge to do something in 2013 to help the Earth, and to record that pledge on a banner for everyone to see. Some of the pledges were particularly inspiring, and I have no doubt that everyone who inscribed the banner will follow through with their vows. Earth Day banner photos by Jessica Burko. April 22nd was definitely a day to remember and one that we will surely repeat next Earth Day and hopefully for many years to come. We will also likely incorporate hands-on craft projects at other group events such as our annual Boston Handmade Marketplace in Union Square Somerville, scheduled this year on July 13th, and possibly at some of our winter holiday events as well. Stay tuned for all the details or join our email list to receive announcements of upcoming events delivered right to your in box. 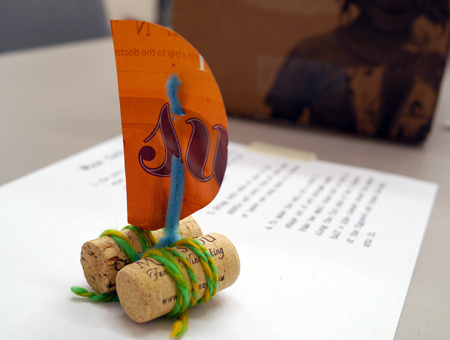 If you have ideas for art and craft projects to do with found or salvaged materials we'd love to hear about it! Please chime in with your comments and be sure to celebrate Earth Day every day with us! 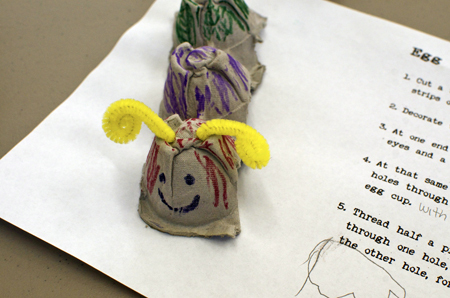 Cardboard caterpillar made from egg carton cups and pipe cleaner. Photo by Kerry Hawkins. 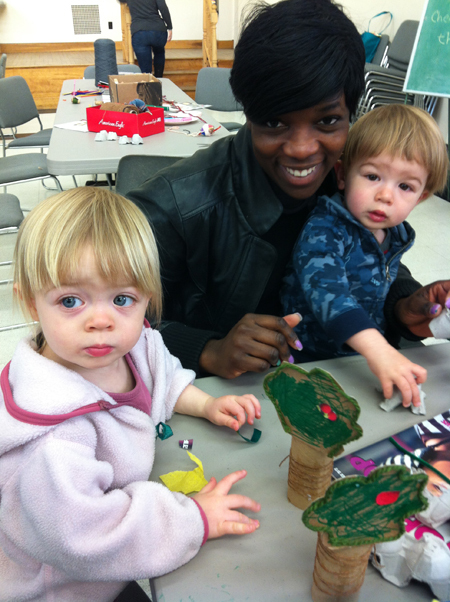 Boston Handmade Alumna Elephunk's Trunk making paper flowers with her son. Photo by Jessica Burko. 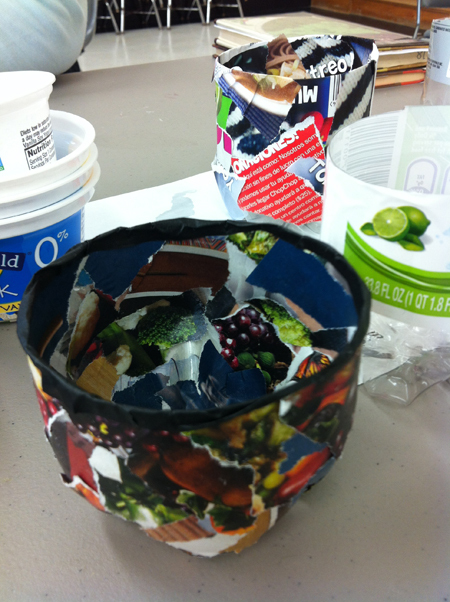 Decorative bowl made from the bottom of a plastic soda bottle and collaged with magazine clippings. Photo by Jessica Burko. It was my pleasure to be part of such a great event. Thanks for organizing it, Jessica!